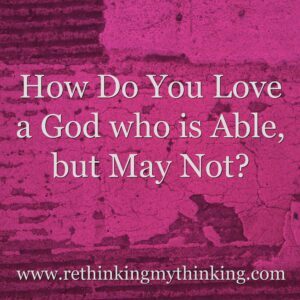 How Do You Love a God Who is Able, But May Not? It is a wonderful thing to know that God is omnipotent. It means that every seemingly impossible circumstance is not hopeless. Miracles can happen. Things can change. But God’s ways are mysterious. He isn’t simply a divine vending machine. Instead He is a God who is able to heal diseases – infertility, cancer, mental illnesses, etc. He is able and yet sometimes He does not. Sometimes He leaves us barren, let’s cancer finish its work, and leaves minds broken. How do we love this God who could change our circumstances, but does not? We have to trust that He has a plan and purpose in our difficult situation. While our arms ache to hold a child and our wombs remain empty we have to believe God knows what is best. When cancer ravages the bodies of those we love or mental illness darkens our relationships with friends and family we have to cling to God’s promises. We we must take our stand with our community of believers helping support us along the way. There in the waters of adversity God is with us. In the floods of grief God strengthens us. How do we love God when we don’t understand why He seems so quiet, why He doesn’t do a miracle for us? We remember who He is, we cling to His promises when we don’t understand, and we trust His ways are better than ours. Friends, if you are suffering from infertility and have so many unanswered questions, I have started a Facebook group for you. Would you join me here? It will be a place of support of encouragement and prayer as you walk this journey. I’d love to have you join me by clicking here. This entry was posted in Rethinking Christian Life, Rethinking Hard Times, Rethinking Infertility. Bookmark the permalink.